Welcome to the Guitarhoo! Guitar App Center. Here you will find use guitar gadgets and freebies. Check back often as new and exciting projects are in the works. From June 2005, in cooporation with IK Multimedia, Guitarhoo! 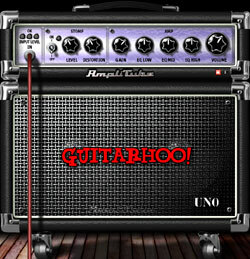 is happy to offer AmpliTube Uno, a guitar amp simulation in software, totally free. Simply download, install, authorize, and enjoy.AmpliTube UNO contains one amp and one distortion pedal effect. It is modeled after a Marshall JCM-800, and features an EQ stage with Lo, Mid, and Hi tone control circuit that recreates the authentic response of the modeled amp, input gain control and an overall output level control. Easy to use, just plug your guitar directly into your sound card, open up Uno and get ready to rock!